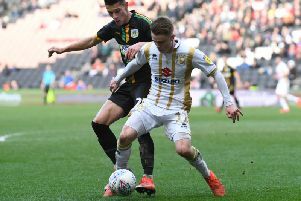 Baily Cargill could not believe his luck when he saw MK Dons had drawn his former club Bournemouth in the second round of the Carabao Cup. The 23-year-old spent his entire career with the Cherries before leaving for Dons in the summer. Cargill said he was excited to go back to the south coast and meet up with some familiar faces again. "I couldn't believe it when I saw we were playing them at their place," he said. "It will be a really nice night for me to go back there and see some familiar faces and some really good friends of mine. It's great for this club too - Bournemouth are a Premier League club, and we'll go there and enjoy the experience." The last time Dons and Bournemouth met was in League 1 in 2013. Prior to that, it was a were regular fixture for both sides, but since, Bournemouth's rise to the Premier League has been nothing short of spectacular, while Dons' fall has been quite the opposite. Cargill praised former manager Eddie Howe for his role in getting Bournemouth to the top flight, but believes Dons boss Paul Tisdale can have the same influence at Dons. He aded: "The gaffer has to take most of the credit for it, it has been an amazing rise and one I'm proud to have been involved in a little bit. I've become a fan of Bournemouth, and it's great to see them out of the hard times and excelling in the Premier League. "Tis is very similar to Eddie, so why can't we do that? Everything is in place here. It has been an amazing journey, but almost a miracle."